Although I'm a "West Coast is the Best Coast!" kinda gal, I will say that there are some things that the East Coast does far better than the West. New York, of course, holds the throne with its superior bagels, cheesecake, and deli cuisine. 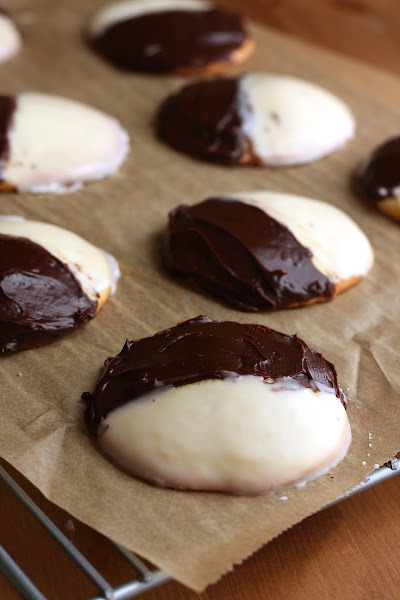 When looking at different black & white cookie recipes, I ran across an old New York Times article waxing poetic about how you can learn a lot about somebody by the way they ate their black & white cookie. Do you eat the vanilla side first? Or the chocolate? Or, for the indecisive and the radical, go crazy and take a bite right down the middle? Preheat the oven to 350 (F). Line two cookie sheets with parchment paper and set aside. 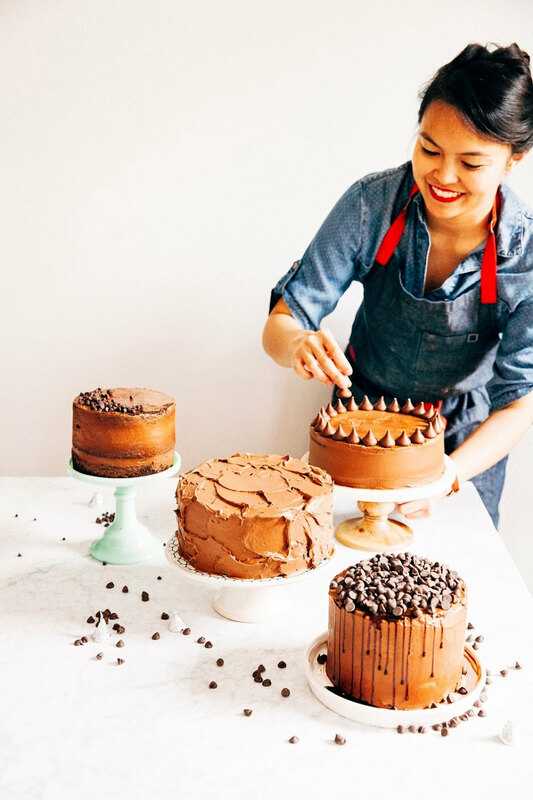 In a medium bowl, whisk together 2 cups all-purpose flour, 1 3/4 cups cake flour, 3/4 teaspoon baking powder, and 1/2 teaspoon salt. Set aside. Using a freestanding mixer with a paddle attachment (or use a handheld whisk), cream together 1 cup plus 2 tablespoons unsalted butter along with 1 1/2 cups sugar. Cream on medium-high speed for at least 5 minutes, or until the mixture is smooth and has significantly lightened in color. Once the sugar and butter has finished the creaming process, turn the mixer to its lowest speed, adding in 4 eggs one at a time, stirring 30 seconds after each addition. Once all the eggs have been incorporated, scrape down the sides of the bowl and stir in 1 1/2 teaspoons vanilla extract along with 1 teaspoon lemon zest. Add half the flour mixture from the earlier step, then, once the flour mixture has been fully incorporated, add half of 3/4 cup buttermilk. Repeat this process until both the flour mixture and the buttermilk has been incorporated into the batter. Be careful not to overmix! Simply stir the ingredients together until just incorporated. Using a 2-tablespoon sized cookie scoop, drop six mounds of dough onto the prepared cookie sheets, spacing each mound 3 to 4 inches apart. 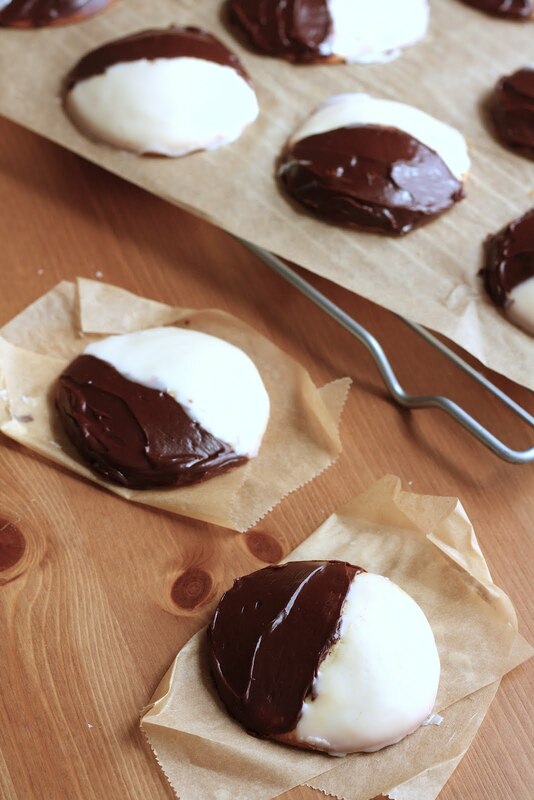 Bake the cookies for 20 - 25 minutes or until the edges are lightly brown. When the cookies are ready, remove from the oven and let rest on the pan for 5 minutes before loosening with a spatula and turning out to cool on a wire rack. Sift 2 cups confectioner's sugar into a large bowl, and use a rubber spatula to stir in 2 1/2 tablespoons milk, 1 tablespoon corn syrup, and 3/4 teaspoon vanilla. The glaze should pour from the spoon in a steady stream -- use additional liquid or confectioners' sugar as needed until you reach the desired consistency. Once you've achieved the desired consistency, use a small icing spatula to outline the dividing point in the center of each cookie where the two vanilla and chocolate frosting will meet. 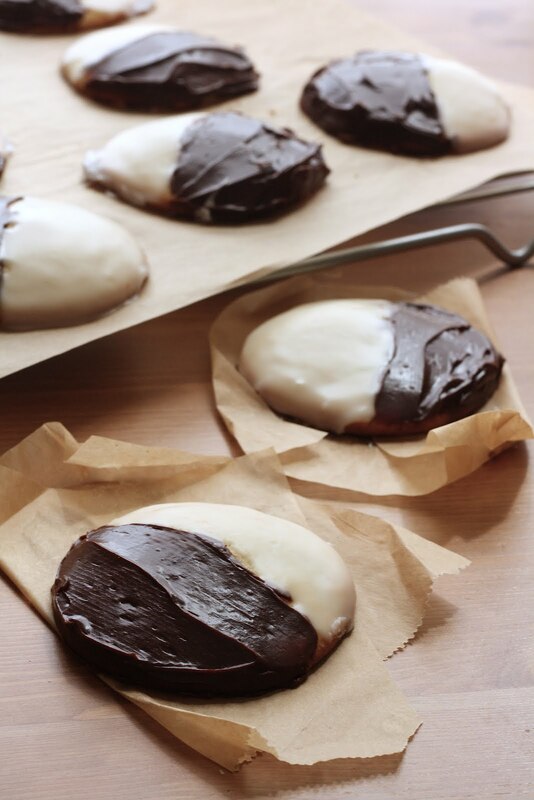 Fill one half of each cookie with vanilla glaze, using the icing spatula to apply it as smoothly as you can. 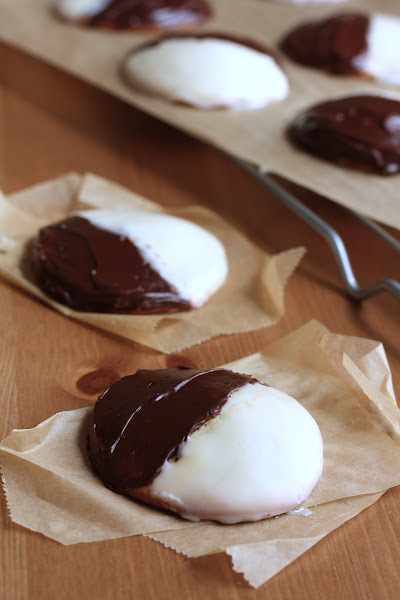 While the vanilla glaze is setting, make the chocolate glaze. Use a double boiler to melt 3 oz. chocolate and 1 tablespoon unsalted butter, stirring together until smooth. Once the chocolate-butter mixture is fully melted and smooth, remove from heat and alternate between adding 1 cup confectioner's sugar and 2 tablespoons boiling water. Stir in 1 tablespoon corn syrup and 3/4 teaspoon vanilla extract, stirring until very smooth. If the glaze is too thick, add more hot water a teaspoon at a time until the desired consistency is reached. 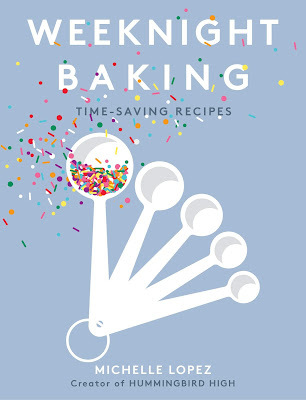 Once the desired consistency is reached, use immediately to frost the half-frosted cookies. By this time, the vanilla frosting should have set. 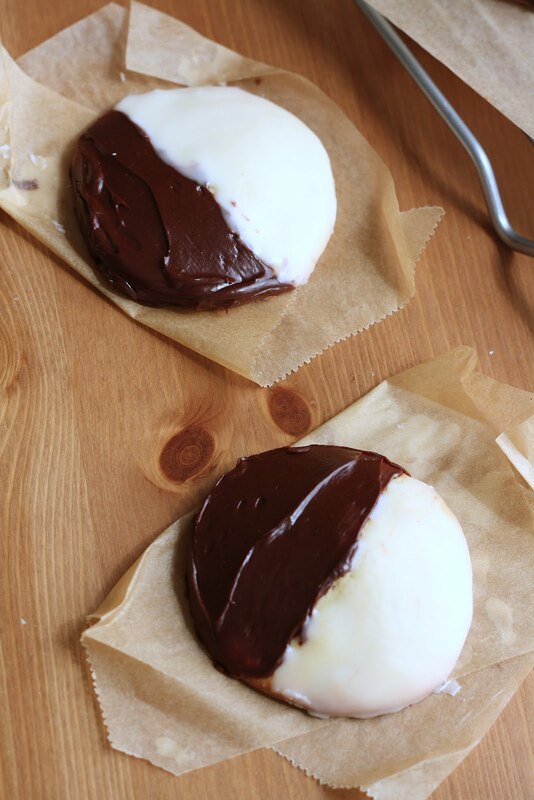 Apply the chocolate glaze on the unglazed halves of the cookies, starting at the dividing point and apply as smoothly as you can. Let the glaze set before storing or eating the cookies -- you can store the cookies in an airtight container, layered between strips of wax paper, for up to 1 week. I love black & white cookies! Looks delicious.